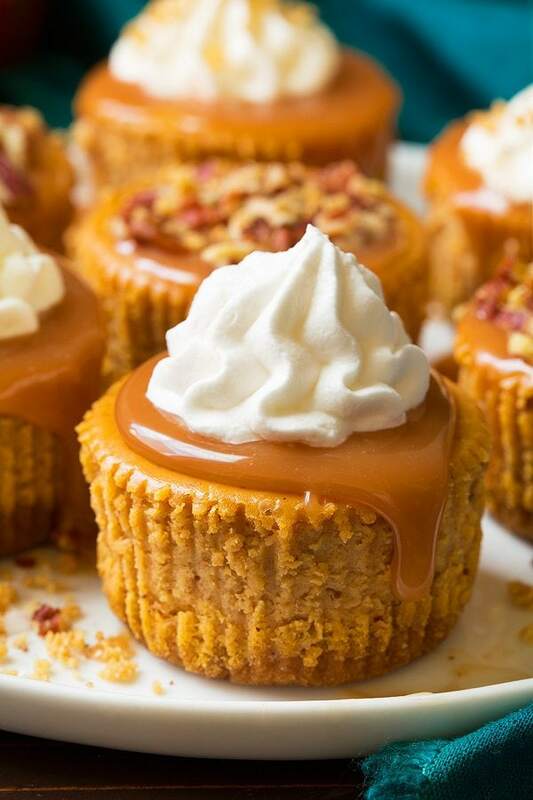 Mini Pumpkin Cheesecakes are the perfect fall dessert! They’re perfectly rich and creamy and brimming with spiced pumpkin flavor. And who can resist that decadent caramel sauce? It’s a match meant to be! 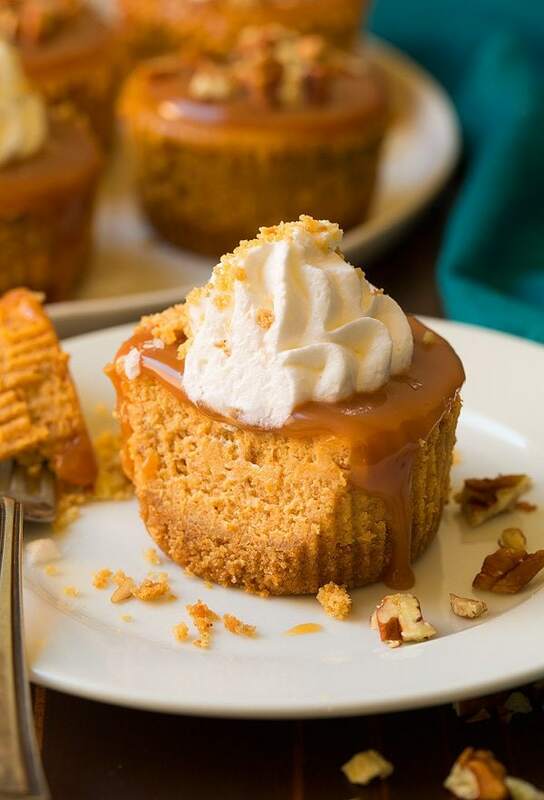 Pumpkin Cheesecake in Cupcake Size Servings! These are one of my favorite fall/Thanksgiving desserts and they are a must on my fall baking list every year. Only the best make it to the Thanksgiving table right? These definitely make the cut. I love that these are in mini individual form so not only are they more fun to serve this way but they also bake faster than a whole cheesecake, plus they take less cooling and chilling time than a whole cheesecake does. I also love they make enough to feed a crowd since you get 24 from this recipe (but it is easy to split in half if you are serving a smaller group). These will likely be the most talked about dessert at the Thanksgiving table, try them and you’ll see why. 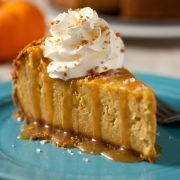 They have all those delicious pumpkin pie spices we all crave (but not so much that it overwhelms the flavor of the cheesecake). They also have the most creamy, luxurious texture (one of the main reasons I’m so obsessed with cheesecake), and you get the perfect light balance of tang to balance out their sweetness. And of course let’s not forget the salt! I love Maldon salt. Those little flaked pyramids of salt just make me happy. I just always know good things are to come when I break those out. And when you finish them off with whipped cream or pecans they become a show-stopping dessert that will impress anyone! 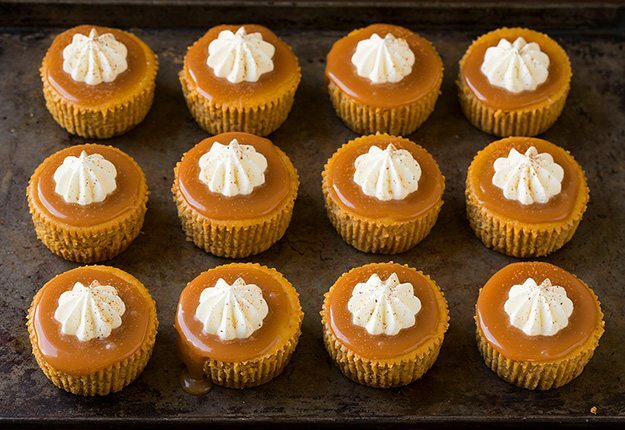 Add these rich and heavenly, caramel drenched mini cakes of pumpkin perfect to your Thanksgiving menu next week! 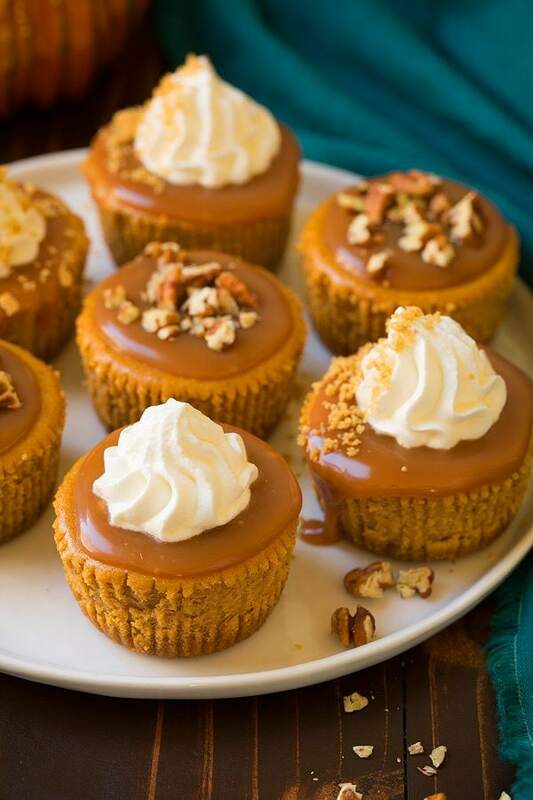 They are what pumpkin dessert dreams are made of! 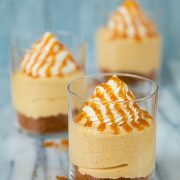 These individual Pumpkin Cheesecakes are the perfect fall dessert! 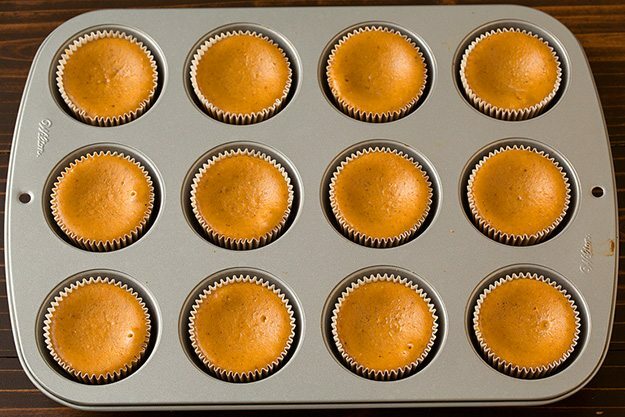 They're perfectly rich and creamy and brimming with spiced pumpkin flavor. And who can resist that decadent caramel sauce? It's a match meant to be! For the crust: Preheat oven to 325 degrees. In a mixing bowl, whisk together crushed graham crackers with 2 Tbsp granulated sugar. Pour in melted butter and stir mixture until evenly coated. Divide graham cracker mixture among 24 paper lined muffin cups, adding about a heaping Tbsp to each. Firmly press mixture into an even layer. Bake in preheated oven 5 minutes. Remove from oven and allow to cool while preparing filling. For the filling: In a medium mixing bowl, whisk together brown sugar, granulated sugar, flour, cinnamon, nutmeg, ginger and cloves until no clumps of sugar remain (break up any little clumps with your fingertips). Add cream cheese to a large mixing bowl, pour sugar mixture over cream cheese and using an electric hand mixer set on low speed, blend together until smooth, about 30 seconds. Mix in eggs one at a time. 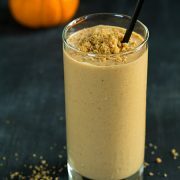 Blend in pumpkin and vanilla, then mix in heavy cream. Tap bowl forcefully against countertop to release some of the excess air bubbles, about 30 times. 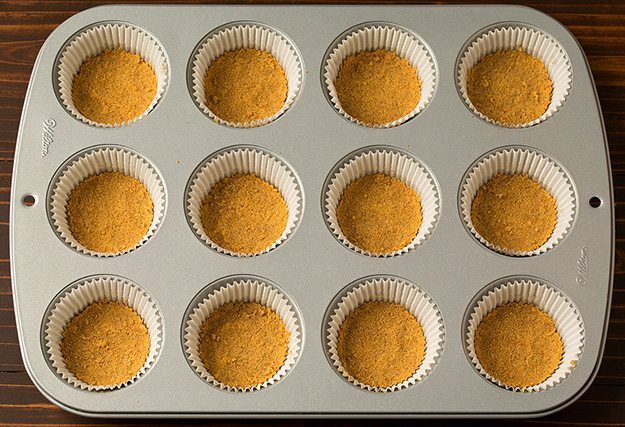 Divide mixture over graham cracker crust in muffin liners, adding about 1/4 cup to each cup and filling nearly full. Bake in preheated oven until nearly set (no longer very jiggly), about 20 - 25 minutes. Remove from oven and allow to cool on a wire rack at room temperature, 30 minutes, then transfer to refrigerator and chill 3 hours until set. Top with caramel sauce and a pinch of sea salt just before serving. Add pecans or whipped cream if desired. Store (caramel and cheesecakes separate) in refrigerator in an airtight container. *Salted Caramel Sauce Recipe here. **Alternately you can mix in 3/4 - 1 tsp fine sea salt with the sugar/water mixture when making the caramel rather then topping them with sea salt. Caramel sauce and toppings not included in nutrition.